I need to look at something interesting today. 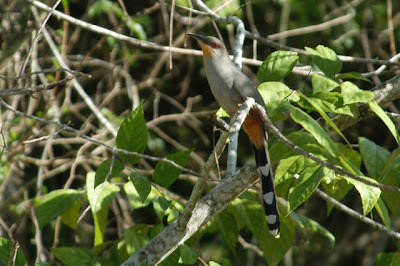 This is Saurothera merlini bahamensis, the Lizard Cuckoo. At 54cm (more than 20 inches! ), it's the largest member of the cuckoo family. The species Saurothera merlini is found only in Cuba (where there are three subspecies) and on three islands in The Bahamas. The bahamensis subspecies is the version of this bird found on Cat Island, Eleuthera and New Providence. It's an uncommon bird and I count myself among the lucky few who have watched this bird do its thing. Most cuckoos hijack the nests of other birds. A female cuckoo finds a nest with eggs in it, gets rid of the eggs it finds and then lays her own in an amazing act of inter-species switcheroo and piracy. The host bird sees eggs in its nest when it returns and then proceeds as if nothing happened. It's a pretty amazing behavior. However, the Lizard Cuckoo is unique for a bunch of reasons, not the least of which is its abstention from this switcheroo behavior. S. merlini bahamensis actually builds its own nest and raises its own young. That might have something to do with the size of this bird. I'd imagine disguising a 15-inch long fledgling is a pretty hard sell. These birds hunt for lizards (hence the common name) and large insects in the underbrush. They are surprisingly agile and can run along the ground when the need arises. Trust me when I tell you that they have a call that can wake the dead.